to embroider eyes and mouth, you will need a very long needle. 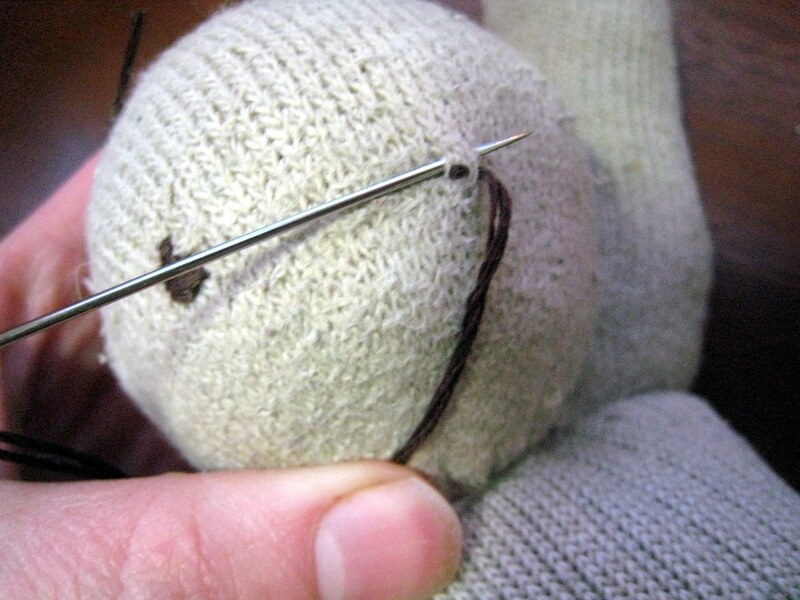 since my sock doll was small-ish, i was able to use a long needle i had on hand. they sell special doll-making needles at the magic cabin and weir crafts (and i'm sure elsewhere too!). there are many different ways to embroider, so certainly experiment with what you like best! take a look at dolls on etsy or others you like! 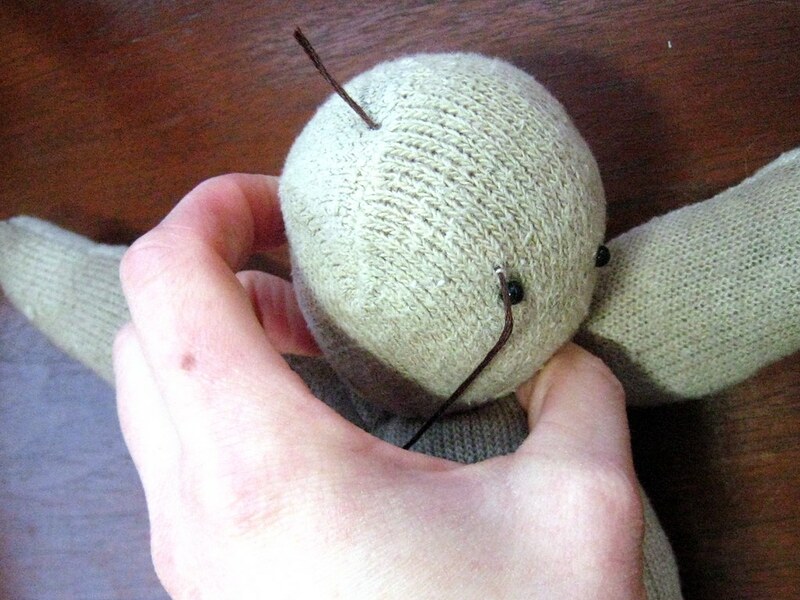 1. find that string round the middle of the doll's head and set pins in there where you want the eyes. take your long needle with a bit of eye-colored embroidery floss, knotted at the end. you'll be bringing the needle from the back of the head (or the top to ease the distance) through to where the pin is located. the knotted end will later be covered by the hair. 2. for my doll's eyes i used simple stacked lines. in this picture you can see that i started at the bottom with a very small stitch. then i brought my needle just outside of the first stitch for the next, and again for the center of the eye. so, i made a total of five stacked stitches. small, med, large, med, small. i've also seen embroidered eyes of simple cross-stitched x-s, or outlined by an embroidered circle then filled. after each eye, i brought the thread back through the head and knotted to secure it. 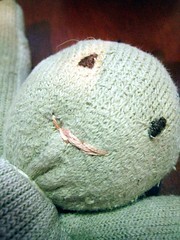 3. my first doll had just a straight stitch for a mouth, and i wanted this one to smile! so i tried overlapping straight stitches in an upward curve. again, i brought the needle through the head where hair would be covering. after that i did shallow stitches for the embroidery, then pulled the thread back through the head to secure it. see what you like! if you are unsure, try embroidering on some scrap before the doll! that's it! next is the hair - i use crochet for that part too. you'll be on your own for clothes though, i just trace and test! please feel free to comment or e-mail me with questions.